Short Take: Fine art photographer who creates panoramic collages by making multiple overlapping frames with a cheap plastic Holga camera. Oren Grad calls it "Holga Cubism." By day, Susan is a computer programmer who works in the music industry. Quote: "The urban experience to me is largely about motion. The intense pace and vitality of the city excites me; I like to shoot fast and furiously, to be totally immersed and to be swept up in, and along with, the tide of the moment." A Taste: "Chinese New Year Crowd (New York City)" (above) and "John Deere Lot (Iowa)" (below). Click on the pictures to see them somewhat larger. Where to see the pictures: "Midwest Medley," solo show at Soho Photo Gallery, 15 White Street, NYC, Nov. 7–Dec. 2, 2006. Reception tomorrow, Tuesday Nov. 7, 6–8 p.m.
Posted by: MIKE JOHNSTON, tip o' the hat to O.G. Featured Comment by C. Gary Moyer: I was able to see the prints in person last night at the show and talk to Susan. They were very impressive and really gather quite the crowd around them. Sorry Mike. You've generally been right on for people you've showcased here but this one is lost on me. After reading your description I was intrigued but in viewing the images rather than seeing a cohesive and creative exploit I see what more resembles the result of not advancing the film correctly than a special artistic effort deserving of high accolades. A mish-mash and messy strip of film that looks merely confused and poorly executed. Do not get me wrong, I am not a realist or purist and can appreciate the work of Holgas (love mine) and the abstract. But after looking over more than a few they look kinda neato but then start to run together (one being little different than the other) and are lacking something over the top or special for me. I disagree with Richard, I think the work is excecuted very well. One problem with this format is that it really doesn't work very well on a computer srceen, the pieces I am sure have a lot more ummph seen on a wall big. It is always slightly annoying to see something you do done better by someone else, but in this case particulrly so, given how difficult that thing is. Plus I have been shooting away for years, with a little Agfa point and shoot from the 60's, thinking no one else would be so insane as to try this (bang goes my bubble). I have rolls and rolls of mistakes to prove it (and very few successes), where just one frame spoils everything, and that frame usually features my feet. 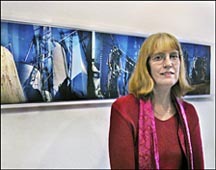 Congratulations to Susan on some beautiful images and a solo show (oh yes I am jealous), I would love to know how she deals with the film density miss matches at the overlaps, the work looks seemless. I've learned not to form hard judgments of work that i can only see in such tiny replications. I'd like to see Susan's work in person. I think she has a good concept but when such work is displayed so small I tend to lean toward Richard's take. It doesn't appear to hang together and pieces don't seem distinctive. But I could be misled. I can see where you're coming from, but overall I tend to disagree. It seems to me that Ms. Bowen's problem is not a lack of creativity or skill, it is a failure to edit her works rigorously. It seems to me that her technique clearly works better in some situations than others, and she has too many pictures on her website that either don't work, or that are too similar. Still, when her approach works, I think it works very well. In particular, I thought the pictures in her "Iowa Meanderings" and "Indiana Wanderings" series were excellent. The best pictures seem to have a dominant color (e.g., blue) and repeating shapes that provide continuity across the constituant exposures. Perhaps unsurprisingly, her current show in NY ("Midwest Medley") seems to focus on pictures from the series mentioned above. See http://www.sohophoto.com/solo_shows/susan_bowen.html, which picks a particularly effective picture for the website. There are also a number that I liked in the NYC Subway series. Still, to each his own. There obviously aren't any right or wrong answers to this stuff, although this perhaps demonstrates the universal need to edit carefully. Personally, I think we should differentiate between someone very innovative (I think the vast majority of us wouldn't come up with such a concept in a million years) and someone making really good art. Do these images make a strong first impression? Oh yes. Do they have a lasting appeal? Well, that's more in the "neeeeh" category. Seen one, seen them all. I was able to see the prints in person last night at the show and talk to Susan. They were very impressive and really gather quite the crowd around them.